DUBAI // The arts received a double boost yesterday with the announcement of two multimillion-dirham projects. 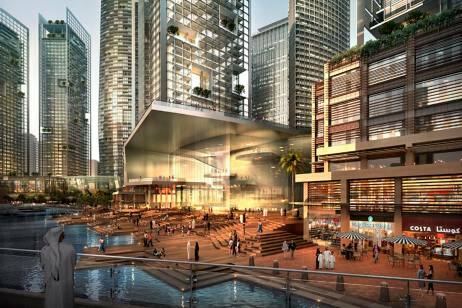 The first, a glittering new cultural district in Downtown Dubai, will cater for aficionados of both opera and modern art. The second, the expansion of the blossoming grassroots art scene in Al Quoz industrial area, will provide studio and gallery space for aspiring artists. Emaar’s Downtown Dubai development was announced by Sheikh Mohammed bin Rashid Al Maktoum, the Vice President, Prime Minister and Ruler of Dubai. The new district will include a modern art museum and opera house. Alserkal Avenue in Al Quoz will double in size by 2014 as part of a Dh50m expansion plan. Both announcements were made on the opening day of the Art Dubai international fair, part of the emirate’s annual Art Week. The plans for Dubai’s new cultural district include not only the opera house and modern art gallery, but two “art hotels”, leisure attractions, design studios and apartments. “The cultural accomplishments of a nation define its character and individuality,” said Sheikh Mohammed in a statement released by the state news agency Wam. “Having demonstrated our credentials in hosting world-class cultural events, the UAE has established itself as a thriving destination for culture and the arts. Mohamed Alabbar, chairman of Emaar Properties, said: “It will be Dubai’s definitive entertainment destination that stimulates creativity, supports the arts sector, and also offers visitors their choice of hospitality and leisure.